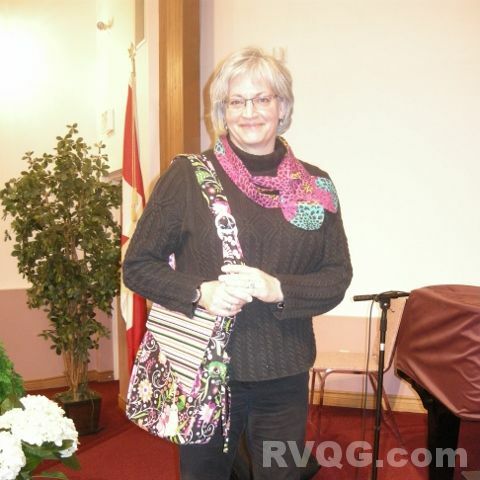 Our March 25 speaker was Brenda Miller of Among Brenda’s Quilts & Bags – Designer extraordinaire! Brenda provided a trunk show with bags, quilts, table runners, place mats and wall-hangings galore, featuring a vast range with something for everyone. Brenda’s bags contain a wide variety of functional pockets, zippers, drawstrings, decorative rings, elastics and even one with a soft waterproof liner used for a cooler bag or baby change pad. Brenda’s beautiful bag samples demonstrated their multi-functionality appropriate for either a little girl, or a ladies elegant evening bag – all determined by the fabric and embellishment choices. Members were in awe of the “Monster Bag” that could hold up to two queen sized quilts! Brenda noted that this bag has two handles, which would allow sharing the load, if it got too heavy for one. Working with Hoffman fabrics of California, Brenda developed several quilt patterns using either Bali Pops, or 5” squares from Hoffman. Brenda also designed a series of patterns with red work embroidery. Quilt patterns ranged from traditional rail fence inspired to modern solid colour combinations, block of the month and quilt-as-you-go styles. Brenda’s inspirations included her pets (cat and dog), international influences (Oriental, Mexican) and even candy – McIntosh’s toffee box colours. The range of styles was impressive! Brenda offered her patterns, notions, fabric and bag supplies for sale during the break, with the help of her friend Janet. Many members lined up to purchase new project plans and supplies. We hope to see some of the finished projects in the near future! The last Block of the Month for our 12 month Calendar Quilt was distributed at the meeting. 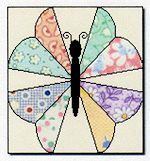 The butterfly design is courtesy of The Quilter's Cache. It is available now on our Block of the Month page. Now that all the blocks are finalized, we are looking forward to seeing some completed tops at future meetings! The next Bee Night, "All Things Baby," is already full. Stay tuned to hear what's scheduled for the last Bee Night of the year in May. To volunteer or just to learn more about any of the positions, please email us at rvqginfo@gmail.com. It was another great meeting! Watch for the Show & Tell photos later this week. Until then, happy sewing!